fundraiser to be held on June 25 at Leedy Voulkos Art Center. 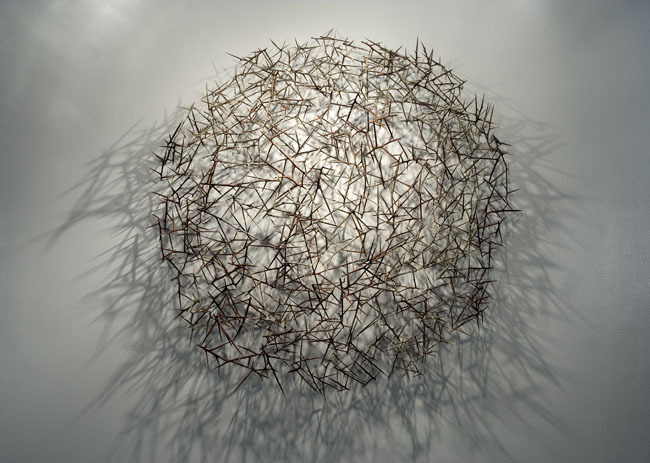 This piece made of thorns from the honey locust tree was part of a temporary installation at the Kansas City Design Center in February. It was 42″ in diameter. This piece is in the auction exhibition at the Nerman Museum to be held on October 24, 2009. I’m interested in this structure as a kind of uncertain sanctuary, suggesting a sense of refuge in discomfort. I’m intrigued by and often overwhelmed with the constant negotiation between order and disorder; the sense of random chaos versus the need for organizing structure. 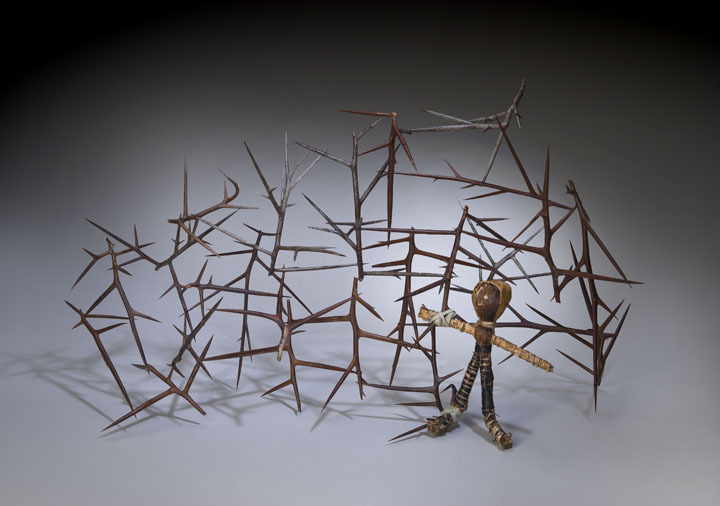 The work is constructed of thorns from the honey locust tree. The holes through which the thorns are pierced are made with the use of a burning tool. The same tool used to make the pyrographs. I regard this thorn installation as a drawing piece. The thorn works are made from the thorns of the honey locust tree. These thorns encircle the trunk as they grow up the tree. They are not parasites but part of the tree itself. Like crosshatch drawings, each thorn responds to the one that came before, finding it’s way across the wall, or down the side of a post. They partner with shadows to make a drawing on the wall. Much as they climb up and around the trunk of the tree, the thorns wander over the wall, searching for crevices, cracks, places to probe in this interior environment. The thorns are self-pierced, with holes made by the pencil-point tip of a wood-burning tool. This process of construction preceded the pyrographs — another form of drawing that comprises a significant part of my work — and led to the use of the burning tool as a means of mark making. The thorn work is very meditative and transcends thought. 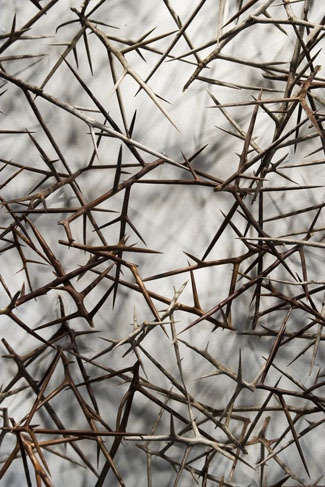 These are details of a honey locust thorn installation at Byron Cohen Gallery. It’s a wall piece approximately 12′ x 10′. I see this installation as a three dimensional drawing.